Who is your “go-to person”? The person you can go to for help, advice or information. 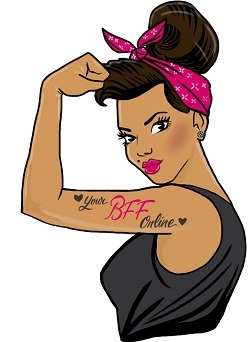 Ilene Carol is Your BFF Online! Bringing you all that’s positive, informative and inspirational, in an entertaining format. News you can actually use, instead of the usual gossip with the same story lines. Need some “girlfriend” advice, but you don’t want to discuss your personal problems, dilemmas or private matters with the people you are around on a regular basis? Ilene Carol will provide you with answers combined with honesty, common sense and a new perspective. What’s on your mind? Send email to: askilene@ilenecarol.com. Ilene Carol is a Mother, Entrepreneur and Founder of ICE MEDIA ENTERTAINMENT. She has 20 years of experience in Operations Management in addition to consulting small businesses, non-profits and individuals since 1995. Her love of sports coupled with her passion for writing led her to interviewing athletes for her magazine creations. The desire to help others started in her youth when she was asked to become a Peer Facilitator. Training was received to assist students struggling with academics, social-emotional issues, peer conflicts, family concerns and the importance of confidentiality. This genuine concern for others, got her voted Most Liked by her peers. As a mother, she continues to take a keen interest in our youth. Volunteering her free time to work with elementary aged children, in particular, mentoring and reading programs for underprivileged children. Ilene Carol has been involved in various charity events and is a passionate advocate for ALS. Her father, a Veteran, lost his battle to ALS in 2006. She has helped to support those diagnosed with ALS and their families through her magazine dealing with support topics and offering resources. In 2010 she launched a digital publication centered on the Walk to Defeat ALS to help bring awareness to the illness.